Again, have your toppings ready to use before you melt the chocolate for coating the matzos. Line a cookie sheet or jelly roll pan with parchment paper. Melt and stir about 1 1/2 c.* of the chocolate in an uncovered double boiler over water (just below, not touching the top pan) that is just below simmering (not boiling). Be careful not to let any steam or water whatsoever get into the chocolate. Remove from the heat when the chocolate is almost melted and add the remaining approx. 1/2 c.* chocolate. Mix the chocolate well until it's all completely melted, then stir in the tsp. of canola oil. Lay the dipped pieces of matzo onto the parchment paper-lined pan. 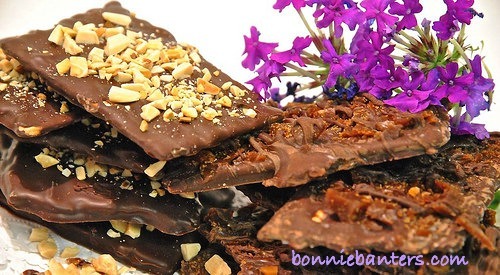 (Set aside leftover melted chocolate to drizzle over the sea salt and burnt caramel matzos.) Immediately add your choice of optional toppings and place in the fridge for approximately 20 minutes, or until set. Place the caramel bits into a microwavable bowl and melt about 2 minutes on high. The caramel should be thick (almost solid) and dark brown. Handle it with caution as it will be very hot! Quickly spread (it will be a slightly thick layer) the melted caramel onto the parchment-lined cookie sheet or jelly roll pan and refrigerate approximately 20 minutes, or until set. Place into a plastic food storage bag and carefully crush with a mallet (not too finely) into medium-sized bits. Sprinkle the sea salt lightly over the chocolate-dipped matzos. Using a zig-zag pattern, drizzle with some of the leftover melted chocolate. Set in the refrigerator approximately 20 minutes, or until firm. 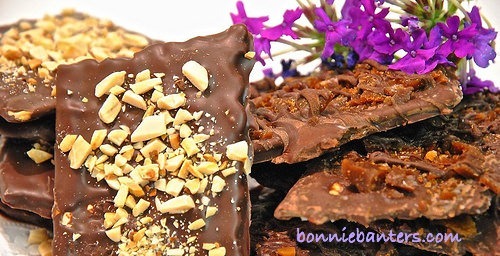 Sprinkle over the chocolate-dipped pieces of matzo and gently press into the chocolate with the back of a plastic spoon. Set in the refrigerator about 20 minutes, or until firm. Be ready to work quickly and have everything ready, with your pans lined and your toppings prepared before melting the chocolate. You can find pre-toasted slivered almonds at Trader Joe's. Don't melt more than 12 oz. of chocolate at a time, if you are making more than one batch. If you have extra melted chocolate, dip pretzels or potato chips into it and set in the fridge until firm. Enjoy...I know you're gonna love them! Thanks so much, Silvia...they truly are! Enjoy!